Several months ago I got an email from someone who was soon to be our newest member. He was looking for a TD to purchase and I told him about one I knew of but had never seen. The car was located in northeastern MD and a bit of a drive from northern VA. But Milton made the trip and was pleased with what he found. We talked while he was there and the car did have a few running problems but the basic car seemed OK, for the price. Milton purchased the car and trailered it home. For the past few months Milton and I have been working through the problems with the car and have corrected many things. The previous owner had the carbs rebuilt and a valve job done and numerous sessions with his mechanic to get it running right. Apparently this never was completely successful and I think the reason for the sale of the car. Milton has fixed a lot of things on this car so far. He has never had an antique car before or done any car mechanical work to any extent. I seemed to have been able to convince him that MGs are hardy cars and respond to the correct type of attention. He purchased a shop manual and a set of SU tools and a Unisyn. We spent a lot of time talking about SU's and how they work and checked and looked for the problems with this pair. Stuck jets and chokes. Mixture out of wack. The biggie was one of the overflow tubes was slightly clogged. Thanks for reminding me, Bill Ludtke. He's retorqued the head, adjusted the valves and set the timing. Air pressure, shock links, shock fluid and toe in. Spark plugs were correct but set to .012". Binding choke cable too. Checked out the SU fuel pump and changed the oil a few times due to fuel contamination, our current problem. Milton loves the car. It rewards him with successes. It's an MG and they are just that way. Did I tell you I have never actually met Milton, but we've spent several hours on the phone. If you need your SU's tweaked, you might converse with Milton Babirak. He's gotten quite good at it! By now I hope everyone is aware of the reduction of the anti-wear oil additive ZDDP to our normally available motor oils. This was reduced to make emissions friendlier to the catalytic converter on modern cars. It does not help our engines with flat tappets though, and without it premature cam lobe and lifter wear may occur. I won't go into a lot here but I do recommend that if you are not versed on this you should find out by searching the Internet and current car mags. A lot is being written and basically what you want to use is one of the few remaining oils with higher levels of ZDDP such as racing oils. I checked Castrol's website and they seem to be working on a remedy for us. I remember having a discussion with Geoffrey Griffiths many years ago. Geoffrey has been one of our BCD vendors for many years and we were talking about how you hardly ever heard of engine failures and worn out engines like you used to. Granted, we don't drive the cars nearly as much or as hard, but we realized that it was the advances in motor oils that are most likely, at least partly responsible. With the loss of this valuable (to us) additive we may be taking a big step back for our engines, but hopefully for the short term. When talking about radiators, have you heard the term "rodding out" I have heard this term before and have even requested that it be done on a clogged radiator from time to time. But I never actually saw it done. A friend up here is a retired radiator repair shop owner and still does some side work. I was over at his shop one day and he has a Model A Ford radiator with the top tank unsoldered and removed and the bottom pipe hooked up to a garden hose. It's laying on a pallet with a brick propping up the opened end. He is sliding a flat rod in and out of the exposed tube ends and I watch as clumps of rusty matter tumble out with the water flow. Next hole the rod gets stuck and when he pulls it out it's covered in grease. "Water pump over greased" he says. I never really thought about why the shop manuals always tells you one or two strokes of the grease gun for the water pump. Seems it gets past the seal, melts and liquefies and then solidifies in the tubes when it cools down and there after starts the clogging process. Something to be aware of. I guess I should wonder how I got this old and did not know that. But wait there's more! 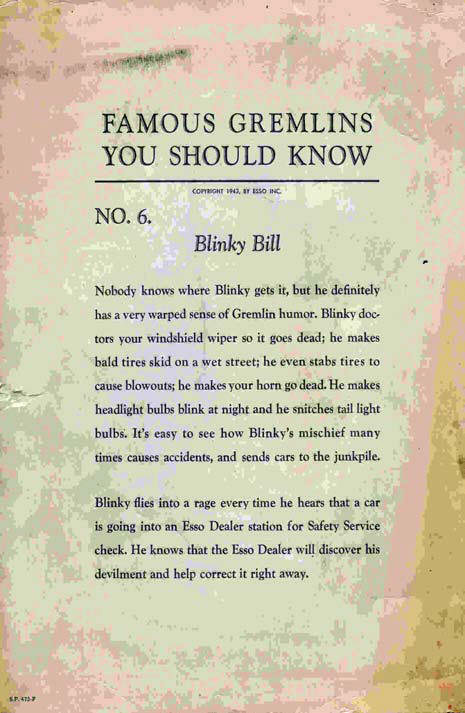 See the portrait of Blinky Bill the ESSO gremlin #6 from 1943. 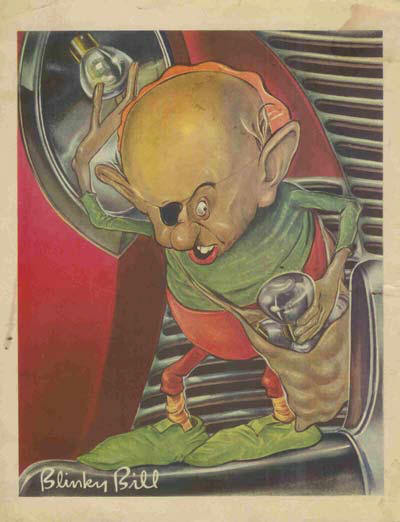 Looks like we already had automobile electrical gremlins here in the US long before the little TC hit our shores. So when you think of the Prince of Darkness, know that your MG may have arrived here in pristine condition and was infected by Blinky Bill who is quite happy to have Sir Joseph Lucas take all the blame.